From our house to yours, may your day be filled with cheer! PS: he knows he is not a moose, or a mouse for that fact. And all thru the house, all us creatures are stirring... cooking, cleaning, wrapping... you know all those things we do to get ready for the big day! Our stocking are hung, by the chimney with cheer. In hopes that St Nicholas soon will be here! I do love my new Christmas tree. No mess'in with lights that won't light, no needles shedding all over the carpet... A life is good. And there are so many buttons to hang them on too! ...But there is always next year! 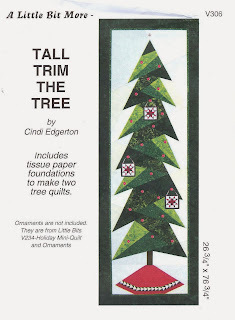 This fun little pattern, which is 4"x6"
Packs a big Door size tree. Actually it holds 2 complete paper piecing sheets for door size trees! Wow, do those large pieces go together fast! Oh I am hearing clatter... not from the chimney, but the kitchen, I think that's my que to get off the computer and lend a hand! They have such a subtle way of telling you don't they! Merry Christmas to all... and to all a good day! Not for the true to heart! When I stumbled on this wonderful pattern "Vintage Tin" from Crabapple Hill, I knew I had to make it for someone special for Christmas. Now my big issue, was there was no where near enough time to get it done, by the time I found the pattern! What to do, What to do?? 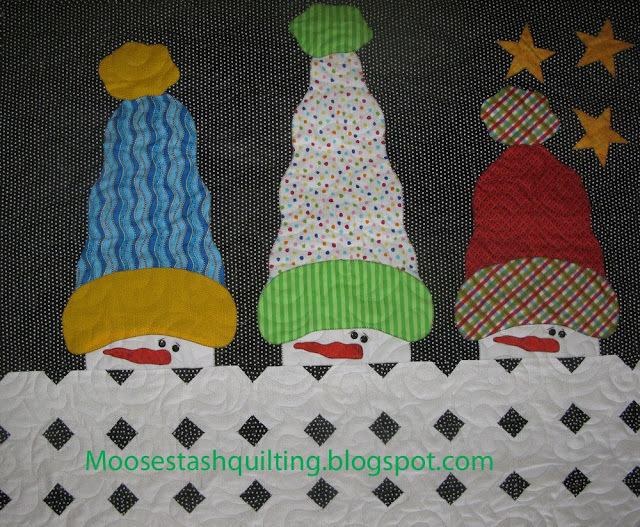 Hummm... free motion quilting, I have always loved that. Wonder if I could just free motion stitch the design. I did use a heavy quilting thread for my top thread, so it would show up better, since I was not going to be hand embroidering it. I do a lot of jumping around. It's much easier for me to trim out of the jump threads, than stop and start all the time. But it certainly is an option that works! Especially if you are in a real time crunch! I do love the detail of this pattern. So many little things that any car guy would pick up on, for sure! 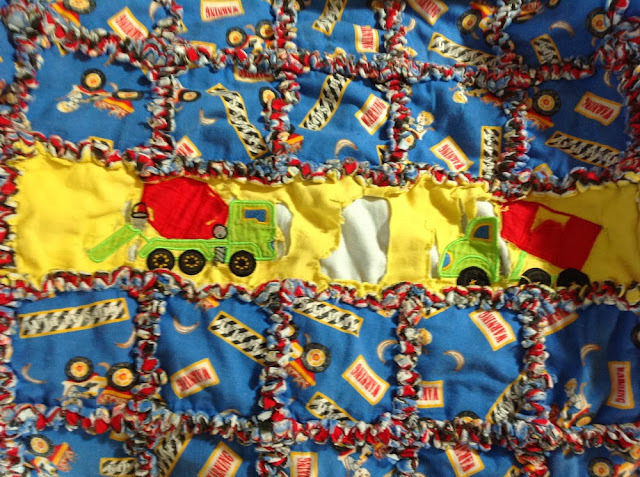 and a great stash buster for the quilter! Can there be a better combo? And to top it all off, this fun little label is included with the pattern. 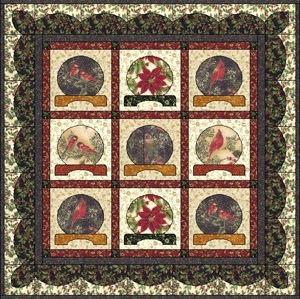 I put this on my longarm once it was done and ran a simple little pantograph over it all. It's not for the purest for sure, but in a pinch, it worked out well. Thank goodness, my guys are not connoisseurs, they wouldn't notice or appreciate all the hand work that went into it anyway! LOL!! Wishing you all the very Merriest of Christmas's and a Happy New Year! You know it's all worth it, when you find that one of your quilts were just "loved to death". I asked my brother to take pictures of the quilt his little one has dragged around for years. Pretty sad, it is! 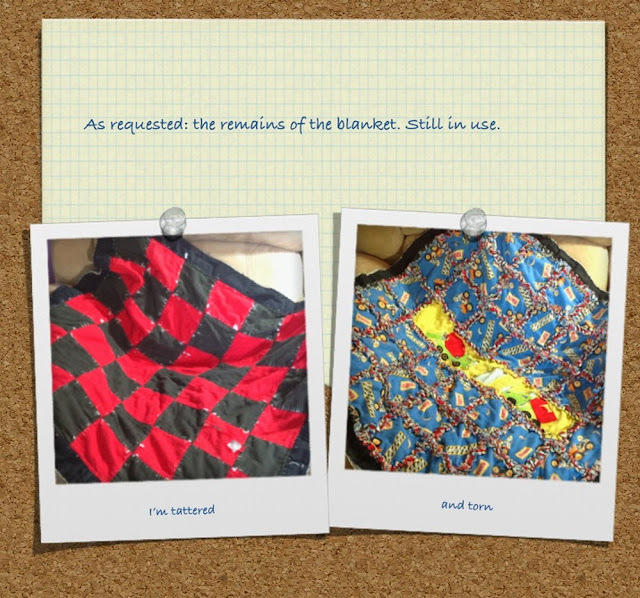 It was made from scraps, 6 or 7 years ago. I scrounged to find enough fabric to make the darn thing. It really was just a bonus quilt in my mind. But in the mind of a 2 year old, it was his new best friend. It's been everywhere he has, and he never goes to sleep without it. Even getting it away from him to wash, was a challenge. Trying to sneak it out at night after he went to sleep, didn't work out well for them. Ended up when it was time, he would pull up a chair and sit in front of the washer and dryer and not leave until he had it in his hands again! LOL! Now that is real love, I'd say. Somebody has a birthday this week, and guess what???? There is a new twin size, big boy quilt that he is getting. I was thrilled to find this flannel.. You couldn't get much closer to the original one I used. We are not going to share what with Mr. Mason. To being referred to as a "baby". I hope it will be a good substitute! I became very enchanted with the eye spy theme quilts this past year with the Nancy Drew blog hop. 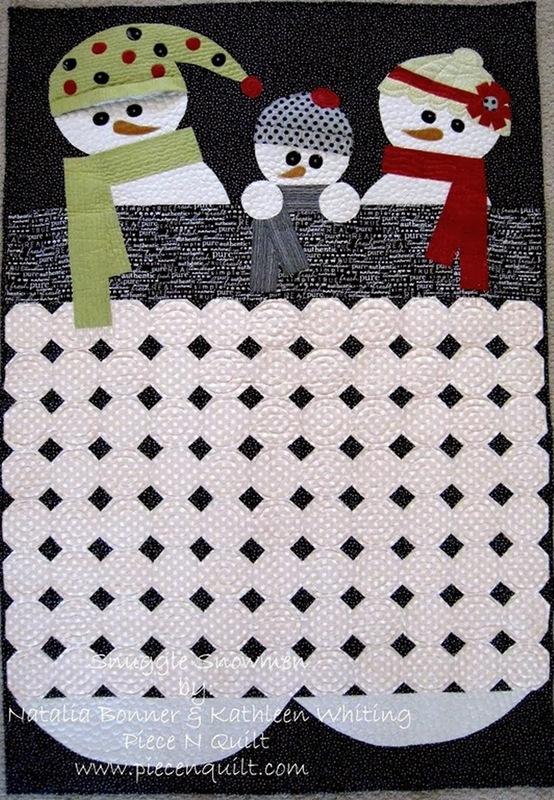 There are so many different types of "spy" quilts you can do. With all the Christmas fabrics that I have collected, I knew these snow globes would be perfect! My quilt is longer than most. 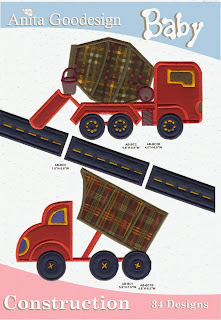 to make a commemorative Holiday quilt! Bet you have someone on your list who could use one too! It is a fast and easy pattern to do. I have to share. I used a gold Glide thread by Fil-Tec, for the first time, to quilt this. My HQ16 has always been an easy machine to stitch with, but this thread ran thru it like a dream. Not one thread break in the entire quilt. 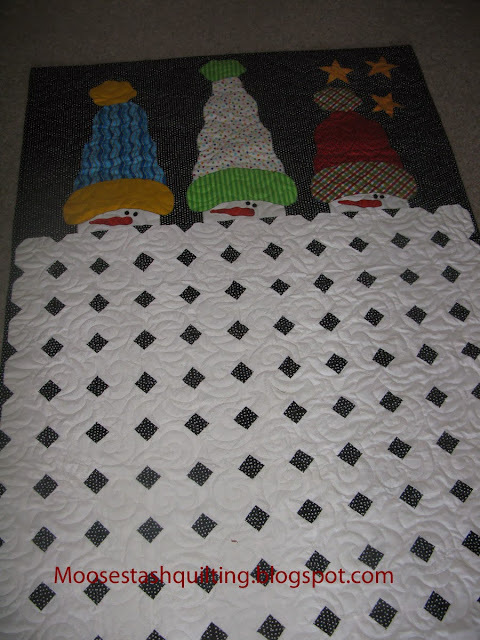 Oh it was a great quilting day! A big thanks to Hoffman Fabrics and Denise for sharing such a fun and easy pattern with us! With those little faces peaking over the snowball pile, I knew I was going to have to jump in and play with this one myself. My version is a bit different. I made my snowball pile bigger, to keep those toes nice and warm! LOL!! I even dug thru the pattern pile, and found this pattern that I bought years ago. It had never opened, but was perfect for my quilt! So there you have it. 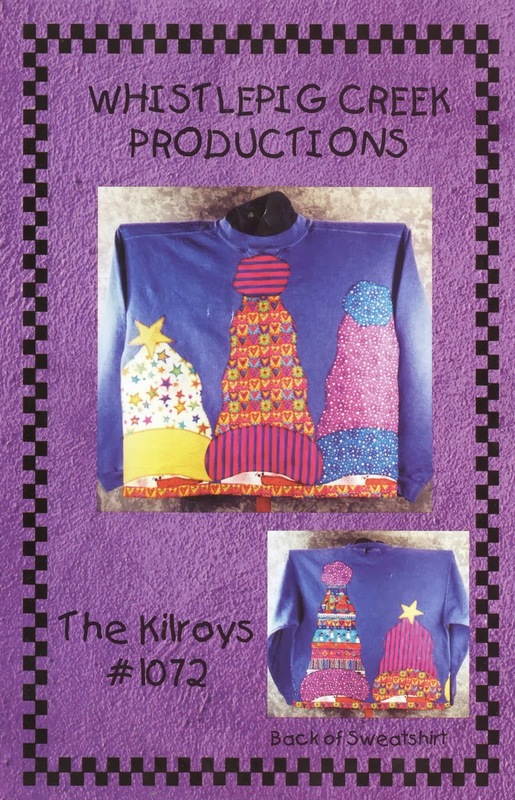 My version of the Kilroy's Snuggle Snowmen! Natalia and Kathleen for sharing their inspiration with us!